When we spotted Ann-marie Vaux's beautiful paper crafts on LinkedIn, we knew we would have to share her designs with you! Ann-marie hails from East Yorkshire, United Kingdom, and she designed this Modern Floral Divine hand-made card especially for Yarn Scissors Silk; you'll find her detailed instructions below. Ann-marie: When I was so kindly asked to create a project for this gorgeous website, I knew I had to use a favorite set of stamps & dies that I own. They are so useful and you can create so many different looks with them, I think they suit a modern look and this project is just that, a clean modern look that could be adapted to suit many different occasions depending on the items you have already in your crafty stash. Craft is my passion, I love designing and creating, so when 'Yarn Scissors Silk' approached me to collaborate with them to create a project, I jumped at the chance to share some of my creativity in an easy step by step for beginners. YSS: Do you have any tips for beginners new to paper crafting? Ann-marie: The best tip I could give anyone that is new to paper crafting is to just play with papers, stamps and dies, have fun with everything. Use papers from full collections as the color matches will be easier until you build your confidence to selecting individual papers and don't be afraid to try different techniques. YSS: What inspires your creativity? Ann-marie: I find inspiration in everything around me and my "design brain" never stops thinking about what is going to be next. I love having an idea, and designing a range of products, then bringing the products to life through different projects. YSS: Thank you so much for agreeing to make this custom project especially for Yarn Scissors Silk, Anne-marie! Stop by Ann-marie's page on Crafts U Print to see her beautiful collection of over 46000 downloads (!! ); she's also on Facebook and Pinterest, and provides elegant craft inspiration on her blog. Without further ado, here are Ann-marie's step-by-step instructions to make the hand-made paper craft card she designed, Modern Floral Divine! Cut a layer approx 1/4-inch smaller than the folded base card, to create your base layer, then using flat tape or a gun runner, attach the layer to the card blank. Cut a layer from the general white card stock to create another layer for the card, this wants to be approx 1/4-inch smaller than the red layer. Once cut to size, stamp the sentiment towards the lower half of the card in the center; I used a Docrafts sentiment and black permanent ink. On extra white cardstock, start stamping the florals from the stamp & die set; I used black permanent ink so it will not smudge when I color them all in. Carry on stamping all the florals and greenery, a number of times to ensure there will be enough to use on 2 sides of the sentiment. Once all the stamping is finished start adding color to your flowers. Take the color over the outer edge of each stamped design using a water-filled waterbrush to create tones on your stamped images and to save having a white edge when they are die-cut. Color in the rest of the images. Die cut the stamped images using craft masking tape to hold the dies in place. Carry on die cutting all the images until they have all been cut out. 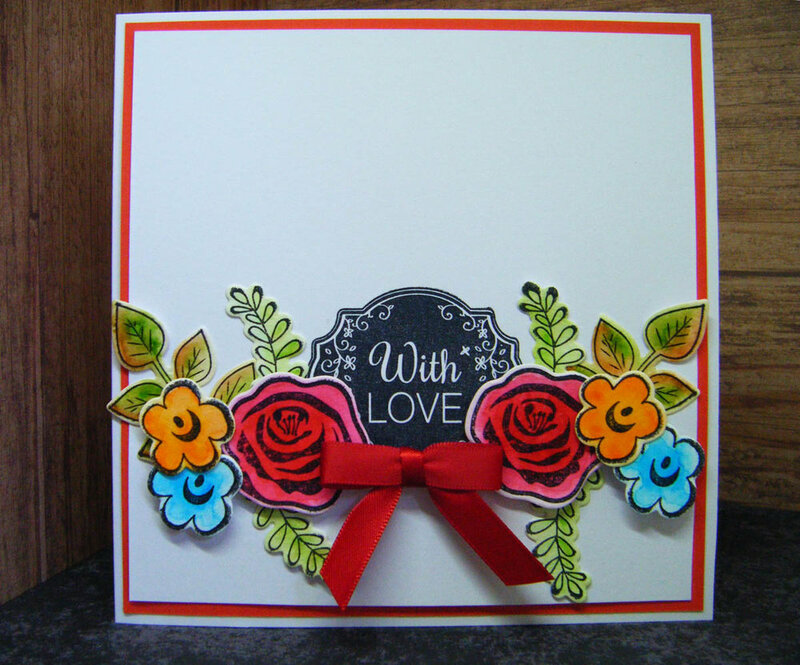 Using flat tape or a tape runner, attach the stamped sentiment layer to the front of the card. Start adding the greenry to the card on one side of the sentiment using wet glue. Carry on adding the greenry die cuts to the other side of the card, making them look nearly the same on both sides. Add 3D foam to the back of the die cut florals. 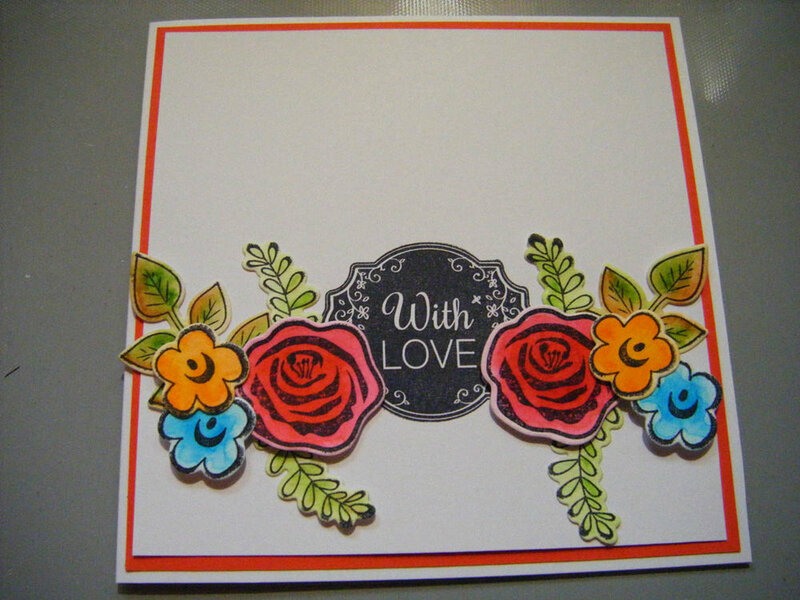 Start adding the larger florals to the card over the greenry die cuts. Then add the smaller flowers next to the large flowers. The card will now be looking very nearly finished. 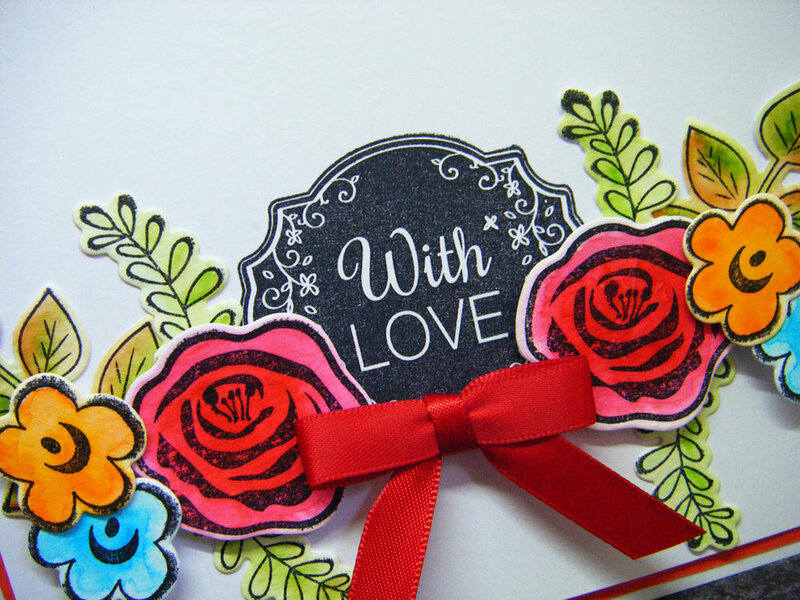 Using 3D foam on the back of your bow, add it to the card front under the sentiment. Find more fun DIY & Craft projects on Yarn Scissors Silk!